Plasmodium is a genus of unicellular eukaryotes that are obligate parasites of vertebrates and insects. The life cycles of Plasmodium species involve development in a blood-feeding insect host which then injects parasites into a vertebrate host during a blood meal. Parasites grow within a vertebrate body tissue (often the liver) before entering the bloodstream to infect red blood cells. The ensuing destruction of host red blood cells can result in disease, called malaria. During this infection, some parasites are picked up by a blood-feeding insect, continuing the life cycle. Plasmodium is a member of the phylum Apicomplexa, a large group of parasitic eukaryotes. Within Apicomplexa, Plasmodium is in the order Haemosporida and family Plasmodiidae. Over 200 species of Plasmodium have been described, many of which have been subdivided into 14 subgenera based on parasite morphology and host range. Evolutionary relationships among different Plasmodium species do not always follow taxonomic boundaries; some species that are morphologically similar or infect the same host turn out to be distantly related. Plasmodium is a eukaryote but with unusual features. The genus Plasmodium consists of all eukaryotes in the phylum Apicomplexa that both undergo the asexual replication process of merogony inside host red blood cells and produce the crystalline pigment hemozoin as a byproduct of digesting host hemoglobin. Plasmodium species contain many features that are common to other eukaryotes, and some that are unique to their phylum or genus. The Plasmodium genome is separated into 14 chromosomes contained in the nucleus. Plasmodium parasites maintain a single copy of their genome through much of the life cycle, doubling the genome only for a brief sexual exchange within the midgut of the insect host. Attached to the nucleus is the endoplasmic reticulum (ER), which functions similarly to the ER in other eukaryotes. Proteins are trafficked from the ER to the Golgi apparatus which generally consists of a single membrane-bound compartment in Apicomplexans. From here proteins are trafficked to various cellular compartments or to the cell surface. Like other apicomplexans, Plasmodium species have several cellular structures at the apical end of the parasite that serve as specialized organelles for secreting effectors into the host. The most prominent are the bulbous rhoptries which contain parasite proteins involved in invading the host cell and modifying the host once inside. Adjacent to the rhoptries are smaller structures termed micronemes that contain parasite proteins required for motility as well as recognizing and attaching to host cells. Spread throughout the parasite are secretory vesicles called dense granules that contain parasite proteins involved in modifying the membrane that separates the parasite from the host, termed the parasitophorous vacuole. Species of Plasmodium also contain two large membrane-bound organelles of endosymbiotic origin, the mitochondrion and the apicoplast, both of which play key roles in the parasite's metabolism. Unlike mammalian cells which contain many mitochondria, Plasmodium cells contain a single large mitochondrion that coordinates its division with that of the Plasmodium cell. Like in other eukaryotes, the Plasmodium mitochondrion is capable of generating energy in the form of ATP via the citric acid cycle; however, this function is only required for parasite survival in the insect host, and is not needed for growth in red blood cells. A second organelle, the apicoplast, is derived from a secondary endosymbiosis event, in this case the acquisition of a red algae by the Plasmodium ancestor. The apicoplast is involved in the synthesis of various metabolic precursors, including fatty acids, isoprenoids, iron-sulphur clusters, and components of the heme biosynthesis pathway. The life cycle of Plasmodium involves several distinct stages in the insect and vertebrate hosts. Parasites are generally introduced into a vertebrate host by the bite of an insect host (generally a mosquito, with the exception of some Plasmodium species of reptiles). Parasites first infect the liver or other tissue, where they undergo a single large round of replication before exiting the host cell to infect erythrocytes. At this point, some species of Plasmodium of primates can form a long-lived dormant stage called a hypnozoite. It can remain in the liver for more than a year. However, for most Plasmodium species, the parasites in infected liver cells are only what are called merozoites. After emerging from the liver, they enter red blood cells, as explained above. They then go through continuous cycles of erythrocyte infection, while a small percentage of parasites differentiate into a sexual stage called a gametocyte which is picked up by an insect host taking a blood meal. In some hosts, invasion of erythrocytes by Plasmodium species can result in disease, called malaria. This can sometimes be severe, rapidly followed by death of the host (e.g. P. falciparum in humans). In other hosts, Plasmodium infection can apparently be asymptomatic. Within the red blood cells, the merozoites grow first to a ring-shaped form and then to a larger form called a trophozoite. Trophozoites then mature to schizonts which divide several times to produce new merozoites. The infected red blood cell eventually bursts, allowing the new merozoites to travel within the bloodstream to infect new red blood cells. Most merozoites continue this replicative cycle, however some merozoites upon infecting red blood cells differentiate into male or female sexual forms called gametocytes. These gametocytes circulate in the blood until they are taken up when a mosquito feeds on the infected vertebrate host, taking up blood which includes the gametocytes. In the mosquito, the gametocytes move along with the blood meal to the mosquito's midgut. Here the gametocytes develop into male and female gametes which fertilize each other, forming a zygote. Zygotes then develop into a motile form called an ookinete, which penetrates the wall of the midgut. Upon traversing the midgut wall, the ookinete embeds into the gut's exterior membrane and develops into an oocyst. Oocysts divide many times to produce large numbers of small elongated sporozoites. These sporozoites migrate to the salivary glands of the mosquito where they can be injected into the blood of the next host the mosquito bites, repeating the cycle. Plasmodium belongs to the phylum Apicomplexa, a taxonomic group of single-celled parasites with characteristic secretory organelles at one end of the cell. Within Apicomplexa, Plasmodium is within the order Haemosporida, a group that includes all apicomplexans that live within blood cells. Based on the presence of the pigment hemozoin and the method of asexual reproduction, the order is further split into four families, of which Plasmodium is in the family Plasmodiidae. Species infecting monkeys and apes (the higher primates) with the exceptions of P. falciparum and P. reichenowi (which together make up the subgenus Laverania) are classified in the subgenus Plasmodium. Parasites infecting other mammals including lower primates (lemurs and others) are classified in the subgenus Vinckeia. The five subgenera Bennettinia, Giovannolaia, Haemamoeba, Huffia, and Novyella contain the known avian malarial species. The remaining subgenera: Asiamoeba, Carinamoeba, Lacertamoeba, Ophidiella, Paraplasmodium, and Sauramoeba contain the diverse groups of parasites found to infect reptiles. Estimates for when different Plasmodium lineages diverged have differed broadly. Estimates for the diversification of the order Haemosporida range from around 16.2 million to 100 million years ago. There has been particular interest in dating the divergence of the human parasite P. falciparum from other Plasmodium lineages due to its medical importance. For this, estimated dates range from 110,000 to 2.5 million years ago. 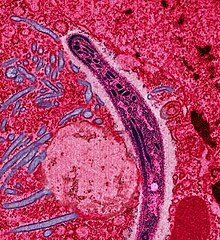 All Plasmodium species are parasitic and must pass between a vertebrate host and an insect host to complete their life cycles. Different species of Plasmodium display different host ranges, with some species restricted to a single vertebrate and insect host, while other species can infect several species of vertebrates and/or insects. Many birds, from raptors to passerines like the red-whiskered bulbul (Pycnonotus jocosus), can carry malaria. Plasmodium parasites have been described in a broad array of vertebrate hosts including reptiles, birds, and mammals. While many species can infect more than one vertebrate host, they are generally specific to one of these classes (such as birds). Humans are primarily infected by five species of Plasmodium, with the overwhelming majority of severe disease and death caused by Plasmodium falciparum. Some species that infect humans can also infect other primates, and zoonoses of certain species (e.g. P. knowlesi) from other primates to humans are common. Non-human primates also contain a variety of Plasmodium species that do not generally infect humans. Some of these can cause severe disease in primates, while others can remain in the host for prolonged periods without causing disease. Many other mammals also carry Plasmodium species, such as a variety of rodents, ungulates, and bats. Again, some species of Plasmodium can cause severe disease in some of these hosts, while many appear not to. Over 150 species of Plasmodium infect a broad variety of birds. In general each species of Plasmodium infects one to a few species of birds. Plasmodium parasites that infect birds tend to persist in a given host for years or for the life time of the host, although in some cases Plasmodium infections can result in severe illness and rapid death. Unlike with Plasmodium species infecting mammals, those infecting birds are distributed across the globe. Species from several subgenera of Plasmodium infect diverse reptiles. Plasmodium parasites have been described in most lizard families and, like avian parasites, are spread worldwide. Again, parasites can result either in severe disease or be apparently asymptomatic depending on the parasite and the host. A number of drugs have been developed over the years to control Plasmodium infection in vertebrate hosts, particularly in humans. Quinine was used as a frontline antimalarial from the 17th century until widespread resistance emerged in the early 20th century. Resistance to quinine spurred the development of a broad array of antimalarial medications through the 20th century including chloroquine, proguanil, atovaquone, sulfadoxine/pyrimethamine, mefloquine, and artemisinin. In all cases, parasites resistant to a given drug have emerged within a few decades of the drugs deployment. To combat this, antimalarial drugs are frequently used in combination, with artemisinin combination therapies currently the gold standard for treatment. In general, antimalarial drugs target the life stages of Plasmodium parasites that reside within vertebrate red blood cells, as these are the stages that tend to cause disease. However, drugs targeting other stages of the parasite life cycle are under development in order to prevent infection in travelers and to prevent transmission of sexual stages to insect hosts. The mosquito Anopheles stephensi is among the blood-feeding insects that can be infected by a species of Plasmodium. In addition to a vertebrate host, all Plasmodium species also infect a bloodsucking insect host, generally a mosquito (although some reptile-infecting parasites are transmitted by sandflies). Mosquitoes of the genera Culex, Anopheles, Culiseta, Mansonia and Aedes act as insect hosts for various Plasmodium species. The best studied of these are the Anopheles mosquitoes which host the Plasmodium parasites of human malaria, as well as Culex mosquitoes which host the Plasmodium species that cause malaria in birds. Only female mosquitoes are infected with Plasmodium, since only they feed on the blood of vertebrate hosts. Different species affect their insect hosts differently. Sometimes, insects infected with Plasmodium have reduced lifespan and reduced ability to produce offspring. Further, some species of Plasmodium appear to cause insects to prefer to bite infected vertebrate hosts over non-infected hosts. Plasmodium was first identified when Charles Louis Alphonse Laveran described parasites in the blood of malaria patients in 1880. He named the parasite Oscillaria malariae. In 1885, zoologists Ettore Marchiafava and Angelo Celli reexamined the parasite and termed it a member of a new genus, Plasmodium, named for the resemblance to the multinucleate cells of slime molds of the same name. [notes 1] The fact that several species may be involved in causing different forms of malaria was first recognized by Camillo Golgi in 1886. Soon thereafter, Giovanni Batista Grassi and Raimondo Filetti named the parasites causing two different types of human malaria Plasmodium vivax and Plasmodium malariae. In 1897, William Welch identified and named Plasmodium falciparum. This was followed by the recognition of the other two species of Plasmodium which infect humans: Plasmodium ovale (1922) and Plasmodium knowlesi (identified in long-tailed macaques in 1931; in humans in 1965). The contribution of insect hosts to the Plasmodium life cycle was described in 1897 by Ronald Ross and in 1899 by Giovanni Batista Grassi, Amico Bignami and Giuseppe Bastianelli. In 1966, Cyril Garnham proposed separating Plasmodium into nine subgenera based on host specificity and parasite morphology. This included four subgenera that had previously been proposed for bird-infecting Plasmodium species by A. Corradetti in 1963. This scheme was expanded upon by Sam R. Telford in 1988 when he reclassified Plasmodium parasites that infect reptiles, adding five subgenera. In 1997, G. Valkiunas reclassified the bird-infecting Plasmodium species adding a fifth subgenus: Bennettinia. ^ The plural of Plasmodium is not Plasmodia. Instead multiple species of the genus are referred to as "Plasmodium species". ^ "CDC - Malaria Parasites - About". CDC: Malaria. U.S. Centers for Disease Control and Prevention. Retrieved 28 December 2015. ^ a b Zilversmit, M.; Perkins, S. "Plasmodium". Tree of Life Web Project. Retrieved 1 June 2016. ^ Obado, Samson O; Glover, Lucy; Deitsch, Kirk W. (2016). "The nuclear envelope and gene organization in parasitic protozoa: Specializations associated with disease". Molecular and Biochemical Parasitology. 209 (1–2): 104–113. doi:10.1016/j.molbiopara.2016.07.008. PMID 27475118. ^ a b Jimenez-Ruiz, Elena; Morlon-Guyot, Juliette; Daher, Wassim; Meissner, Markus (2016). "Vacuolar protein sorting mechanisms in apicomplexan parasites". Molecular and Biochemical Parasitology. 209 (1–2): 18–25. doi:10.1016/j.molbiopara.2016.01.007. PMC 5154328. PMID 26844642. ^ Counihan, Natalie A.; Kalanon, Ming; Coppel, Ross L.; De Koning-Ward, Tania F. (2013). "Plasmodium rhoptry proteins: Why order is important". Trends in Parasitology. 29 (5): 228–36. doi:10.1016/j.pt.2013.03.003. PMID 23570755. ^ a b Kemp, Louise E.; Yamamoto, Masahiro; Soldati-Favre, Dominique (2013). "Subversion of host cellular functions by the apicomplexan parasites". FEMS Microbiology Reviews. 37 (4): 607–31. doi:10.1111/1574-6976.12013. PMID 23186105. ^ a b Sheiner, Lilach; Vaidya, Akhil B.; McFadden, Geoffrey I. (2013). "The metabolic roles of the endosymbiotic organelles of Toxoplasma and Plasmodium spp". Current Opinion in Microbiology. 16 (4): 452–8. doi:10.1016/j.mib.2013.07.003. PMC 3767399. PMID 23927894. ^ McFadden, Geoffrey Ian; Yeh, Ellen (2017). "The apicoplast: Now you see it, now you don't". International Journal for Parasitology. 47 (2–3): 137–144. doi:10.1016/j.ijpara.2016.08.005. PMC 5406208. PMID 27773518. ^ Dooren, Giel; Striepen, Boris (June 26, 2013). "The Algal Past and Parasite Present of the Apicoplast". Annual Review of Microbiology. 67: 271–289. doi:10.1146/annurev-micro-092412-155741. PMID 23808340. ^ a b c "CDC - Malaria Parasites - Biology". CDC: Malaria. U.S. Centers for Disease Control and Prevention. Retrieved 28 December 2015. ^ Markus, M. B. (2011). "Malaria: Origin of the Term 'Hypnozoite'". Journal of the History of Biology. 44 (4): 781–786. doi:10.1007/s10739-010-9239-3. PMID 20665090. ^ Vaughan, Ashley M.; Kappe, Stefan H. I. (2017). "Malaria Parasite Liver Infection and Exoerythrocytic Biology". Cold Spring Harbor Perspectives in Medicine. 7 (6): a025486. doi:10.1101/cshperspect.a025486. PMID 28242785. ^ Morrison, David A. (2009). "Evolution of the Apicomplexa: Where are we now?". Trends in Parasitology. 25 (8): 375–82. doi:10.1016/j.pt.2009.05.010. PMID 19635681. ^ Votypka J. "Haemospororida Danielewski 1885". Tree of Life. Retrieved 1 May 2018. ^ a b c d e f Perkins, S. L. (2014). "Malaria's Many Mates: Past, Present, and Future of the Systematics of the Order Haemosporida". Journal of Parasitology. 100 (1): 11–25. doi:10.1645/13-362.1. PMID 24059436. ^ a b c Valkiunas, Gediminas (2004). "Brief Historical Summary". Avian Malaria Parasites and Other Haemosporidia. CRC Press. pp. 9–15. ISBN 9780415300971. ^ a b Telford S (1988). "A contribution to the systematics of the reptilian malaria parasites, family Plasmodiidae (Apicomplexa: Haemosporina)". Bulletin of the Florida State Museum Biological Sciences. 34 (2): 65–96. ^ Rich, S.; Ayala, F (2003). Progress in Malaria Research: the Case for Phylogenetics. Advances in Parasitology. 54. pp. 255–80. doi:10.1016/S0065-308X(03)54005-2. ISBN 978-0-12-031754-7. PMID 14711087. ^ Martinsen ES, Perkins SL, Schall JJ (April 2008). "A three-genome phylogeny of malaria parasites (Plasmodium and closely related genera): Evolution of life-history traits and host switches". Molecular Phylogenetics and Evolution. 47 (1): 261–273. doi:10.1016/j.ympev.2007.11.012. PMID 18248741. ^ a b Scully, Erik J.; Kanjee, Usheer; Duraisingh, Manoj T. (2017). "Molecular interactions governing host-specificity of blood stage malaria parasites". Current Opinion in Microbiology. 40: 21–31. doi:10.1016/j.mib.2017.10.006. PMC 5733638. PMID 29096194. ^ Templeton TJ, Martinsen E, Kaewthamasorn M, Kaneko O (2016). "The rediscovery of malaria parasites of ungulates". Parasitology. 143 (12): 1501–1508. doi:10.1017/S0031182016001141. PMID 27444556. ^ a b Valkiunas, Gediminas (2004). "Specificity and general Principles of Species Identification". Avian Malaria Parasites and Other Haemosporidia. CRC Press. pp. 67–81. ISBN 9780415300971. ^ Valkiunas, Gediminas (2004). "General Section - Life Cycle and Morphology of Plasmodiidae Species". Avian Malaria Parasites and Other Haemosporidia. CRC Press. pp. 27–35. ISBN 9780415300971. ^ Valkiunas, Gediminas (2004). "Pathogenicity". Avian Malaria Parasites and Other Haemosporidia. CRC Press. pp. 83–111. ISBN 9780415300971. ^ a b Zug, G. R.; Vitt, L. J., eds. (2012). Herpetology: An Introductory Biology of Amphibians and Reptiles. Academic Press. p. 152. ISBN 978-0127826202. Retrieved 16 March 2018. ^ a b c Blasco, Benjamin; Leroy, Didier; Fidock, David A. (2017). "Antimalarial drug resistance: Linking Plasmodium falciparum parasite biology to the clinic". Nature Medicine. 23 (8): 917–928. doi:10.1038/nm.4381. PMC 5747363. PMID 28777791. ^ Cowman, Alan F; Healer, Julie; Marapana, Danushka; Marsh, Kevin (2016). "Malaria: Biology and Disease". Cell. 167 (3): 610–624. doi:10.1016/j.cell.2016.07.055. PMID 27768886. ^ Haldar, Kasturi; Bhattacharjee, Souvik; Safeukui, Innocent (2018). "Drug resistance in Plasmodium". Nature Reviews Microbiology. 16 (3): 156–170. doi:10.1038/nrmicro.2017.161. PMC 6371404. PMID 29355852. ^ Poonam; Gupta, Yash; Gupta, Nikesh; Singh, Snigdha; Wu, Lidong; Chhikara, Bhupender Singh; Rawat, Manmeet; Rathi, Brijesh (2018). "Multistage inhibitors of the malaria parasite: Emerging hope for chemoprotection and malaria eradication". Medicinal Research Reviews. 38 (5): 1511–1535. doi:10.1002/med.21486. PMID 29372568. ^ Crompton, Peter D.; Moebius, Jacqueline; Portugal, Silvia; Waisberg, Michael; Hart, Geoffrey; Garver, Lindsey S.; Miller, Louis H.; Barillas-Mury, Carolina; Pierce, Susan K. (2014). "Malaria Immunity in Man and Mosquito: Insights into Unsolved Mysteries of a Deadly Infectious Disease". Annual Review of Immunology. 32 (1): 157–187. doi:10.1146/annurev-immunol-032713-120220. PMC 4075043. PMID 24655294. ^ a b Busula, Annette O.; Verhulst, Niels O.; Bousema, Teun; Takken, Willem; De Boer, Jetske G. (2017). "Mechanisms of Plasmodium -Enhanced Attraction of Mosquito Vectors". Trends in Parasitology. 33 (12): 961–973. doi:10.1016/j.pt.2017.08.010. PMID 28942108. ^ Stanczyk, Nina M.; Mescher, Mark C.; De Moraes, Consuelo M. (2017). "Effects of malaria infection on mosquito olfaction and behavior: Extrapolating data to the field". Current Opinion in Insect Science. 20: 7–12. doi:10.1016/j.cois.2017.02.002. PMID 28602239. ^ Mitchell, Sara N.; Catteruccia, Flaminia (2017). "Anopheline Reproductive Biology: Impacts on Vectorial Capacity and Potential Avenues for Malaria Control". Cold Spring Harbor Perspectives in Medicine. 7 (12): a025593. doi:10.1101/cshperspect.a025593. PMID 28389513. ^ a b c d e f "The History of Malaria, an Ancient Disease". U.S. Centers for Disease Control and Prevention. Retrieved 31 May 2016. ^ a b McFadden, G. I. (2012). "Plasmodia – don't". Trends Parasitol. 28 (8): 306. doi:10.1016/j.pt.2012.05.006. PMID 22738856. ^ Corradetti A.; Garnham P.C.C. ; Laird M. (1963). "New classification of the avian malaria parasites". Parassitologia. 5: 1–4. ^ Valkiunas, G. (1997). "Bird Haemosporidia". Acta Zoologica Lituanica. 3–5: 1–607. ISSN 1392-1657. Garnham, P. C. (1966). Malaria Parasites And Other Haemosporidia. Oxford: Blackwell. ISBN 978-0397601325. Valkiunas, Gediminas (2005). Avian Malaria Parasites and Other Haemosporidia. Boca Raton: CRC Press. ISBN 9780415300971. Bledsoe, G. H. (December 2005). "Malaria primer for clinicians in the United States" (PDF). South. Med. J. 98 (12): 1197–204, quiz 1205, 1230. doi:10.1097/01.smj.0000189904.50838.eb. PMID 16440920. Archived from the original (PDF) on 2009-03-26. Shortt, H. E. (1951). "Life-cycle of the mammalian malaria parasite". Br. Med. Bull. 8 (1): 7–9. doi:10.1093/oxfordjournals.bmb.a074057. PMID 14944807. Slater, L. B. (2005). "Malarial birds: modeling infectious human disease in animals". Bull Hist Med. 79 (2): 261–94. doi:10.1353/bhm.2005.0092. PMID 15965289. Wikimedia Commons has media related to Plasmodium.